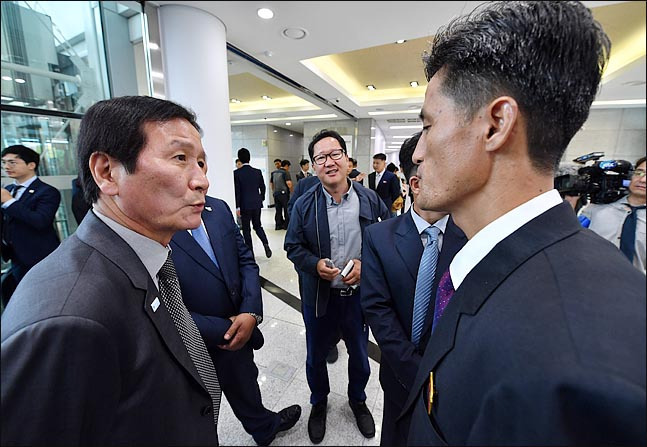 Among those who witnessed the historic opening of the South-North joint liaison office in Kaesong firsthand last week were two business leaders who had once operated factories in the border town. While hoping for the resumption of business in the jointly operated industrial complex, they could only look at the remnants of their once-prosperous investment from afar. Two representatives of the business community who formerly operated factories in Kaesong -- Chung Ki-sub, honorary chairman of the Corporate Association of the Kaesong Industrial Complex, and Shin Han-yong, the current head of the association -- were invited by the Seoul government to attend the opening ceremony for the liaison office. On behalf of more than 100 local firms, the two were able set foot in Kaesong for the first time in 31 months, but remained prohibited from entering the perimeter of the complex, according to the South Korean press pool. For now, all Chung and Shin could do was stare at the abandoned complex -- once bustling with cross-border interactions, but now void of all human activity -- from the freshly renovated four-story liaison office building merely a kilometer from the entrance to the industrial park. “Watching where I used to work and what I used to have within such proximity confused me -- why couldn’t I just have it all back?” Shin asked The Korea Herald on Sunday. “The (Sept. 18-20) inter-Korean summit is coming up and I just hope good results come out of the talks. There has to be some progress made in the (alleviation of sanctions) for the revival of the complex,” he added. The Kaesong industrial park has become a sore subject for Seoul amid the ongoing denuclearization talks between Washington and Pyongyang. A conflict exists between the US and North Korea, with Pyongyang wanting to revive the complex for economic benefits, while the US has repeatedly stressed its support for Seoul’s decision to shut down the complex in 2016. The complex, considered the last vestige of inter-Korean economic cooperation, was suspected to be a source of hard currency that flowed into the North’s nuclear program, before its activities were suspended. Though South Korea has been pushing for the expansion of inter-Korean economic cooperation in recent months, it has also been treading carefully, trying not to irk Washington as it reiterates that the advances in South-North relations must take place in tandem with the denuclearization process. “Despite the will of our government, (the complex) is intertwined with denuclearization issues, so we are uncertain of the timeline for the resumption of (activity at) the complex,” Chung told a group of reporters before crossing the border to the North early Friday. Chung also showed mixed feelings toward Friday’s Kaesong trip, mentioning that it was not happening due to progress on talks about the resumption of business in the industrial park. Prior to the trip, the Seoul government denied any connection between this latest Kaesong visit by the two businessmen and any plans to reopen the now-shuttered industrial zone. But the businessmen also saw a glimpse of hope in the relatively “well-managed” state of the complex, with hints of North Korean efforts to preserve the complex at a moderate level. “I spoke to a North Korean official and heard that the North tried to prevent the water pipes from freezing in the winter. It looks relatively well-managed from the outside,” Shin said. In November 2017, the Seoul government decided to provide financial compensation worth 66 billion won ($59 million) to firms that suffered losses as a result of the Kaesong industrial park shutdown, on top of 517.3 billion won it had already agreed to dole out to firms. The companies claimed they had lost more than 1.5 trillion won, but the government put the estimated damages at 786.1 billion won. The opening of the liaison office came almost a week before the scheduled inter-Korean summit between South Korean President Moon Jae-in and North Korean leader Kim Jong-un, which comes amid a perceived stalemate in denuclearization talks between Washington and Pyongyang. Shin was tapped as a member of President Moon’s 52-member entourage, consisting of government officials, politicians and business leaders, for the Pyongyang trip for Moon’s third meeting with Kim, according to Cheong Wa Dae on Sunday. The business figures are listed as special members of the entourage. The 14-member official delegation comprises ministers, other senior government officials and presidential staff.